After three months of negotiations, An Post has reached a deal with the Irish Postmasters’ Union. 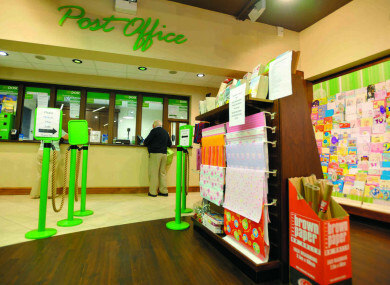 AN POST HAS announced that it has reached a new deal with its postmasters that will see no compulsory closure of post offices. The landmark deal comes amidst a long-running saga of dwindling post office numbers in Ireland, and numerous proposals to try to save the network around the country. It also comes after three months of intense discussions between the Irish Postmasters’ Union and An Post. An investment of €50 million will come from An Post in what it says will grow and modernise the network. The company has committed to a post office for every community of over 500 people, within 15km of 95% of the population, and 3km in urban areas. The newly-formed division An Post Retail will have responsibility for post offices, bill pay and post insurance. On the guarantee of no compulsory closures, An Post said: “While there will be some consolidation to ensure post offices are conveniently and properly located there will be no compulsory closures. The transfer of business to neighbouring offices will ensure the continued viability of these smaller offices in meeting the needs of the community. An Post will open up to 20 new offices in communities of 500+, currently without a post office. In an effort to modernise the services provided by An Post, it will focus on a number of different areas such as e-commerce, community financial services and offering a range of government services. Many of these proposals were contained in a report published in January 2016, that had so far failed to be implemented. Some of the new services will include local banking services, out-of-hours collections and tracking as well as the addition of new formats for e-commerce and parcels within the post offices. One scheme to be piloted immediately will see all citizens able to access online government services through help with digital applications and inputting in the post office. The Irish Postmasters’ Union said in a statement that its executive unanimously supported the proposals, and will ballot it to members over the coming weeks. Its president Paddy McCann said: “We believe that this is the best possible negotiated solution for the future of the post office network. It ensures viability of as large a network as possible, ensures that the public will continue to get an excellent and expanded service and provides viability and clarity for postmasters. Yesterday, An Post announced that it had made an €8 million profit last year. It was also announced that the Department of Social Protection had renewed its contract with An Post for the delivery of social welfare payments, which is a key source of income for postmasters. Email “There won't be any more post offices forced to close as landmark deal reached”. Feedback on “There won't be any more post offices forced to close as landmark deal reached”.